Converter to connect a 20-pin ARM Debug Cable to 16-pin PowerPC connector (PPC4xx). The converter connects the JTAG signals (TCK, TMS, TDO, TDI and TRST) from the Lauterbach debug cable to the connector on the target PCB. which exist on both the ARM cable and the PowerPC connector. The optional signals are connected to a separate pin-header on the converter. and to signal HALT from the PowerPC connector. 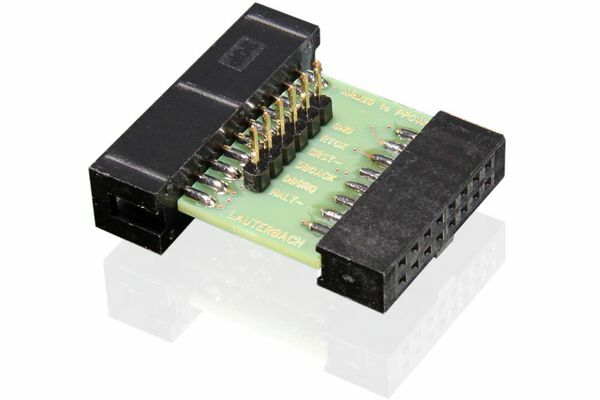 Note: ARC users better use LA-3722 to connect to an ML-509 (XUPV5-LX110T) target board via the 38-pin mictor port, since the 16-pin header is mounted too close to the COM port on that board. (*)Signal TRST optional for normal JTAG test access ports. ">Signal HALT not directly connected to the debugger using the converter. This is a standard 16 pin double row (two rows of eight pins) connector.